Just in case you prefer the interface. Or as a backup to the stuff here. Anyway, I’ve uploaded some recordings to SoundCloud. True Confessions, Heatwave, and One Step Away from an unreleased album with Don MacLeod, Bob Thiel, Bob Cairns and Pat Orchard. More tracks from Sheer Bravado and Scriptwrecked (and maybe some more recent stuff) in due course. On a slightly lighter note, I recently became aware (as per the post The magic fingers of David Harley* – that title is meant to be ironic by the way!) 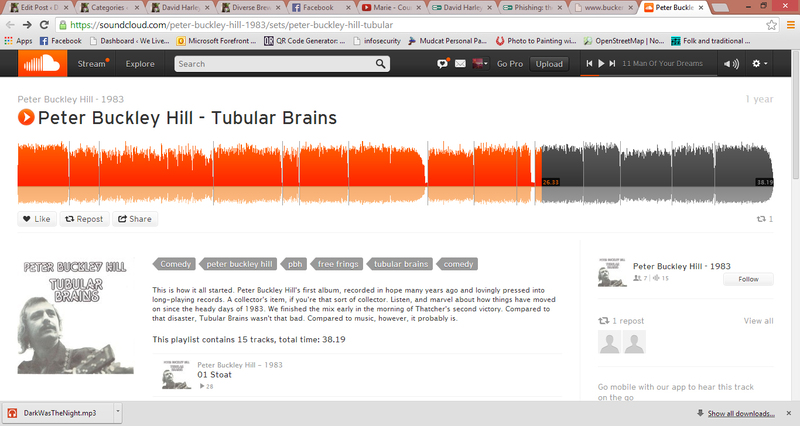 that Peter Buckley Hill has put all the tracks from his first album Tubular Brains onto Soundcloud. In fact, I think all his albums are on there, but I didn’t have anything to do with the others. As you might have guessed from the title, the album is in much more of a comic vein (insert your own jokes about exsanguination here) than my own output. On the original sleeve I think I’m credited as producer (my vinyl is all in a couple of boxes somewhere round here), though to be honest I think those sessions were more about cheerful anarchy than production values. I did play a lot of guitar on it, though, and hearing the tracks again – taken from the vinyl rather than the mastertapes, judging from the ambient noise – there’s some stuff there I really like. Including Peter’s idiosyncratic material and vocals, of course. 🙂 I particularly like the extended fadeout with acoustic lead on Love at first Sight, and while it’s probably not a song I could sing convincingly myself, I’ve thought from time to time that I’d quite like to record a completely instrumental version. That’s on the to-do list. No doubt further skeletons will emerge from the closet in due course. *Suddenly I’m reminded of a witticism of Martin Simpson’s about Manitas de Pescado (Little Fish Fingers): apologies to fans of Manitas de Plata but it still makes me chuckle, though it’s probably politically incorrect. This entry was posted in David Harley, Parody and Pastiche, Peter Buckley Hill on December 31, 2013 by David Harley.